Our current state of poor general health, high stress, and unhealthy lifestyle choices drastically reduce our immune systems’ ability to fight off infection, illness, and disease. In fact, the Center for Disease Control includes antibacterial resistance and a handful of viral epidemics in the top ten health concerns. Yet most of us focus on supporting our immune systems only during the cold and flu season. 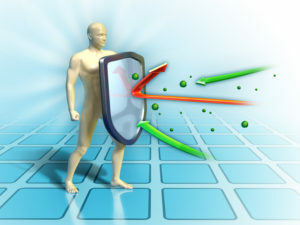 The immune system is our knight in shinning armour and gallant protector of our bodies. Its cells, proteins, tissues, and organs defend our bodies from microorganisms and other invaders. When a threat is detected, the healthy immune system attacks, unless it has been weakened from stress or an improper diet. Our modern lifestyle often exposes our bodies to high levels of toxins and stress. These act to distress the immune system, adrenal glands, and liver, and symptoms including fatigue, digestive distress, allergies, and autoimmune disorders are the result. The National Institutes of Health data shows approximately 23 million Americans suffer from autoimmune disease, and the occurrence of these disorders is rising. Superbugs, another challenge to our immune system, are bacteria that have evolved to become immune to antibiotics. According to the World Health Organization Global Report on Antibiotic Resistance, this is a serious threat that has the potential to affect anyone, of any age, in any country. Common infections and minor injuries that have been treatable for years now can become fatal again. Overusing antibiotics in prescriptions and in agricultural and antimicrobial cleaning products is blamed for the ever-increasing prevalence of antibiotic-resistant microbes. How can we help? Practice better hygiene, use antibiotics only as prescribed by a doctor, and complete the full prescription of antibiotics even when feeling better. Antibiotics not only kill bacteria causing harm to the body, they also attack the natural microbiome, which is the aggregate of microorganisms that exist on and inside the body. The microbiome affects many aspects of human health including mood, digestion, absorption, and immunity. Microbiome research is still in the very early stages. Researchers believe eating processed foods, foods high in sugar, or foods that stimulate inflammation in the digestive tract cause harm to the microbiome. Eating foods that contain indigestible fibers, such as vegetables, fruits, nuts, and seeds, is believed to benefit the microbiome. Some of the good microbes in the digestive tract use these fibers as food. Inulin is thought to be most beneficial to the helpful microbes in the microbiome and is found in high quantities in garlic and leeks. Helpful microbes in the microbiome are also called probiotics. Probiotics support immune health. At a probiotic symposium in London in 2013, probiotic experts discussed the far-reaching health affects of the microbiome, including whether or not its microbes affect the immune system to induce a tolerable (good) or inflammatory (bad) response. Beneficial microbes (probiotics) elicit a strong, effective, and tolerable immune response. Maintaining a microbiome that contains a diverse and robust mix of probiotics improves immune system strength. Factors such as emotional stress, environmental toxins, antibiotic use, travel, and consumption of low nutritional quality food cause probiotics levels in the microbiome to decrease. Population studies show that eating foods containing probiotics—such as fermented dairy products (yogurt, kefir), kombucha tea, kimchi, tempeh and non-pasteurized sauerkraut—can have a beneficial effect on the body’s microbiome. Supplements offer higher dosages of probiotics than foods. Hundreds of research studies have investigated the therapeutic effects of probiotic supplementations. They note probiotic supplements have beneficial effects on many conditions including diarrhea, constipation, H. pylori infections, and irritable bowel syndrome. Researchers have also found that supplementing with a species of probiotics (L. reuteri) reduces the number of sick days that adults require. Statistics show steadily rising rates of chronic disease among North American children and adults. For example, asthma rates in 2003 were 6 percent, compared with 3 percent in 1970. Chronic diseases, such as heart disease, cancer, diabetes, and arthritis, are the most common causes of death. This increase in disease rates is attributed to the increasing prevalence of obesity, higher exposure to toxins, and poor dietary habits. Yet many have forgotten that the underlying factor in most of these diseases is inflammation. Chronic inflammation occurs in an overburdened immune system. Modern lifestyles can put pressure on the immune system, which we need to treat in the same way we nurture our bones and hearts. A supportive lifestyle includes nutrients that support the immune system (see the list of nutrients below) and foods that support probiotic growth and a healthy microbiome. How else can we support our immune system? Wash our hands, get lots of sleep, reduce exposure to toxins by drinking filtered water, and use ‘clean’ cosmetics and body products. The Environmental Working Group offers several excellent resources for reducing toxic exposure in lifestyle and diet. The Dirty Dozen lists foods with the highest pesticide contamination, and the Clean 15 lists foods with the lowest. Eating clean foods may be the most important aspect of strengthening your immune system. Many foods help detoxify the body naturally. Fibrous foods such as psyillium, raspberries, and almonds help trap toxins in the digestive system and assist in elimination through feces. Seaweeds are high in natural metal-chelating aligns which help bind heavy metal. L-cysteine found in poultry, such as turkey, is effective at binding heavy metals. Another way to protect yourself is to support your detoxing organs. Milk thistle is clinically proven to support the liver. Also, support the adrenal glands by reducing stress and including in your diet key nutrients that the adrenals need to function, such as vitamin C. Include B vitamins to support adrenal function. According to a paper published in Integrative Medicine, the use of adaptogens, such as Siberian ginseng, Ginkgo bilboa, or Rhodiola rosea can also assist adrenals under stress. To function at its best, the immune system needs key nutrients including protein, zinc, B vitamins, and antioxidants such as vitamins E, C and selenium. Many herbal medicines have been well researched for their ability to benefit immune function. Omega 3 fatty acids Fatty fish, hemp, flax seeds, chia seeds Increase prostaglandin levels, which help control allergic manifestations by blocking mast cells. Vitamin A Sweet potatoe, pumpkin, tuna Needed for thymus and spleen health, which are locations for white and red blood cell formation. Andersen Stress-induced adrenal dysfunction. Intregrative Med; 2008:7-5. Severe Acute Respiratory Syndrome (SARS). U.S. National Library of Medicine. Ebola Virus Disease – World Health Organization. Global Report on Antibiotic Resistance – World Health Organization, 2014. Thomas, L. et al. Exploring the influence of the gut microbiota and probiotics on health: a symposium report. Br J Nutr 2014;112(1):S1-18. U.S. Centers for Disease Control and Prevention. National Surveillance for Asthma, United States 1980 to 2004. Tubeilus, P. et al. Increasing work-place healthiness with the probiotic Lactobacillus reuteri: a randomized, double-blind, placebo-controlled study Environ Health 2005 Nov 7;4:25.